My mother was an expert at sewing and loved to shop for fabric. As a child, I spent hours and hours with her in the fabric store, leafing through pattern books, touching the bolts of cloth, and listening to the flipping of the bolt on the cutting table. After the fabric was measured out, the snipping scissors alerted me that the magic moment was about to occur. I always watched as the clerk leaned forward and sliced cleanly through the fabric with her open scissors. I did not inherit my mother’s talent nor her love for sewing, but still I go to the local fabric store every so often for small items. This store has been around for about twenty-five years, and is a fixture in our town. 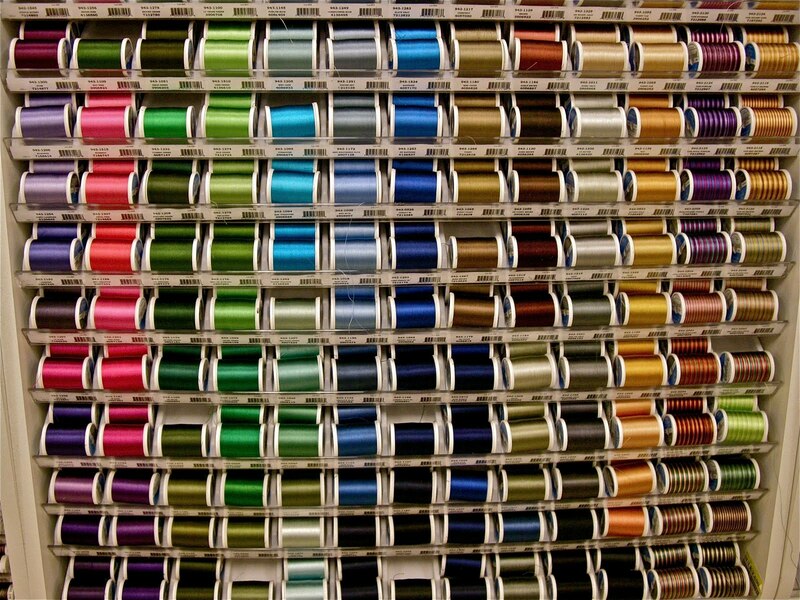 When I go, I linger there, looking at the various bolts of fabric, thinking about the possibilities within, remembering past times. Last week as I approached the doors, I smiled, thinking about how lovely it was that specialized, locally-owned places like these still exist. Entering the store, I stood and stared. At least fifty other women were in there, buzzing around, their arms filled with fabrics. There were long lines at the cutting table. One woman was cleaning out the Velcro supply. Had there been a sudden, urgent resurgence in sewing? Now, my mother taught me about wonders of iron-on interfacing, how to open the long, smooth file drawers to find a pattern, and how to check for the bias of a fabric. I figured out myself, not to stand between a determined woman and a bolt of $55.00-a- yard ultra-suede that had been reduced by 30 percent. 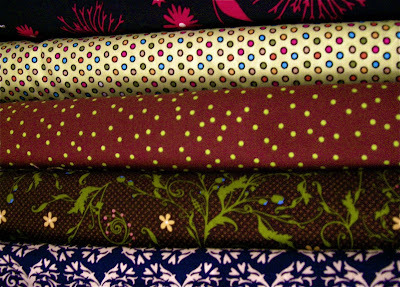 Moving deftly around the store, I avoided the women who were making a beeline for the quilting supplies. I stepped aside just in time to avoid getting wiped out by determined woman with fabrics stacked up in her arms like holy books she had to save from destruction. I moved into the upholstery fabric section to see women bobbing up and down like hulls of sailboats, grabbing at rolls above their heads, bringing them down like masts and then swinging them like booms as they went back after another. Feeling a little seasick, I ducked down under the rolls in the women’s arms and I made it to the oilcloth section, got what I needed and then went to join the fifteen or so women in line waiting to check out. The older woman in back of me started up a conversation. We discussed the projects we were planning and then she showed me some starch product she was buying. “When you iron your husband’s pants and shirts, this is a miracle product,” she said. I left the store, with my purchase and a sense of sadness too. From now on I’ll have to go to one of the big chain craft stores to seek out material and other supplies. More than that, though, the real sadness comes from the fact that when I walked in a store like that, the smells, the sights, the sounds all took me back to those times with my mom. Life had been hard on her and normally she was somewhat guarded and pessimistic. However, in the fabric store, she changed. She saw possibilities. She felt in control. She could let the creative side of her come out to play for a little while. As I look back on those many hours I spent in the fabric store with my mom, I realize that though I may not have learned how to sew, I did learn some things about life. I learned that fabric, like people, can only appreciated when you see them in their fullness and consider all their possibilities. I learned that beauty is not to be found only in the silk and taffeta moments in life, but also in the simple muslin and cotton ones as well. I learned that one small straight pin, like one small thought or word can be a problem or a solution, depending on how you use it. I learned that it isn't easy, but you can alter a pattern, even one that’s been around for years. And just last week, my experience taught me that places and people we assume will be around forever can and do shut down, close up, and go away. We can carry the treasures away in our arms or in our hearts. What we make out of them is completely up to us. Wonderful story again Betty. All the more reason to appreciate what you've got while you still have it. I always hate to hear about small locally owned businesses going out. I wish we had more of them instead of the big chains. That's a wonderful lesson you learned from your mother. And don't sales like that just make people a little crazy? What a beautiful post Betty! What a touching story, Betty. It is sad how progress marches on and leaves the simpler way behind. You'll always have the memory, if not the activator. An absolutely beautifully written post! The fabric store I went to with my mother was Mary Jo's and I hated being in there because Mother took so darn long to make her choices. She is still sewing- she made Birdie's graduation dress. She made all of our girls' prom dresses and Breezy's wedding gown. The thing that amazes me is how the girls can draw what they want and Mother puts it together without a pattern! My daughter always loved going to Piece Goods with me. She especially loved feelint the fabrics and loved putting the spools of thread back in their place after finding them in the wrong spot. Great story Betty,as always a pleasure to read. Beautiful story Betty and your Mother taught you well. The closing of these stores has made me sad as well. It's like little bits of our country's history is just going away to be but a mere memory. Oh, Betty, I'm so sorry. We used to have a fabric story like that in my home town. I would go with my grandmother. She had to touch every fabric as if it would speak to her. "What can I be?" I haven't sewn in years but I have tons of scraps upstairs in a box. Someday I figure I'll make a quilt. Someday. Thanks for the life lessons from Mom. Beautiful. For me, it was Nana and cooking, not Mom and sewing, but I get it. This was a very touching post. Your blog is my 3rd stop this morning and after reading this, all I can say is WOW! Betty, I could go on and on about this lovely story, but I won't! It's so beautifully written....I have no other words to say! Thank you for sharing it with us. AWESOME post! Love how you gave us a life lesson. I think the cotton and muslin moments are my favorites. Thanks for the reminder. Your mom sounds just fantastic. I feel about your writing like I do about Hilary's photography. They're both exquisite. You evoke such emotions with your writing. And the lessons learned from those trips to the fabric store and the resulting creations by your mother were wonderful. Well done, BB. It's sad when change isn't always for the better. Great post! I could hear those scissors cutting the fabric. I went with my grandmother and it was mystical as a kid, wondering what everyone was making.I have a sewing lady who has made me a few things and does my repairs. Beautiful post, Betty. I can imagine the sound of a scissors sliding through fabric, and your post brought me back to my own hours spent in a store like this. I feel patterned scrapbook paper is so similar to patterned fabric, and love the whole creative process. This post made me smile. It's always sad when a landmark closes its doors. My grandmother was a seamstress. I still remember the little sundresses she made for me for Easter when I was little. Interesting how a relatively insignificant event like a fabric store clearing out can evoke such deep and poignant thoughts. That's a lovely post-Mother's Day tribute. I, too, spent a fair amount of time picking through patterns with Mom. I still have a shirt she made for me of silk my brother bought in Thailand. Yet, somehow, I managed not to take as many lessons away from it as you did! What a wonderful story/post. My grandmother is an amazing seamstress, knitter, crocheter - you name it. I did not inherit her skills, but I did inherit her love of fabrics. I love how you said that fabric, like people, can only be appreciate when you see them in their fullness and consider all their possibilities ~ what a perfect way of putting it. Betty, this is simply lovely. Your life lessons are especially wonderful. Thank you. Did you know that many WalMarts (maybe all, by now) no longer carry bolts of material, only pre-cut pieces, meant mostly for quilting. It is sad that the small independent stores can't make a living anymore. This post made me cry. But in a happy/sad, nostalgic way that's really very nice. Memories of my own Mom and all. It is a tragedy that we let small town America and small town business be dissolved so easily. Sorry for the loss your area suffered because this business had to close. Even sorrier (if that's a word) that most people won't realize it was a loss. Wow, so well written! I loved reading this post. My mom sewed too. I remember the thin paper patterns that she would spread out on the table and then her pinning the fabric to it. She never was very good at it, but she too, like your mom, changed when she was sewing. All her anxiety left her face and she could just focus on the task at hand. I never did learn how to sew, but I truly wish I could have learned before she died. I've always thought that one day, when my boys are bigger, I will teach myself. Thanks for sharing your bittersweet memories with us! Such ironic symbolism in your post, the shutting down of the hometown store and your moms Alzheimer's. Injected with some humor and a lesson! Such a beautiful post! I am so sorry about the store closing down. That's sad. I hate to see those little ma and pa shops go out of business. It's such a shame. Great story, great post and so true! Thanks for this foray into the fabric. I can tell it was a bit of an emotional journey for you. This brought me home, in a real way. Some of my sweetest mom moments involved her seamstressing (picking out fabric with her, watching her sew my new dress..). I never directly learned about bias from her, but it's all interwoven. Isn't it? Hugs and appreciation for this one. A heartwarming, and sad, story. It's like you are losing a piece of you with that store closing. Love your story. So touching. Whenever I go into a fabric store I get bored really easily. I don't do crafts at all and every major time I go with my mom she either is there for a while with a project in mind she also says that I still need to learn. I don't sew myself, but I have the same memories with my mother. I went into our local fabric store a couple of months ago to buy iron-on patches for a pair of old jeans. I wished that day that I liked to sew. How can you be so funny and sad in the same story? I love visiting our local agway store because it's so similar to the one where I grew up. I visited there with my mother or father hundreds of times in my youth. Hope you keep all the memories. "The flipping of the bolt on the cutting table". That was enough for me, although I read the whole piece with relish! You brought back a world of memories with that phrase, for I, too, was the daughter of an expert seamstress. I'll see you one "flipping of the bolt on the cutting table" and raise you one "felt the touch of her icy cold fingers as they expertly tugged and pinned the material to the proper tightness and length". Thank you, Betty. For a moment, memories of my Mom came rushing back. My family had a retail/wholesale fabric business in a little country village. We lived above the store. Saddest day of my mum's life when we had to close it down. We couldn't compete with the franchises. We have an I-Run (as per Mad's pronunciation) and an I-Running board. Mad saw it in use the other day and was fascinated. I'm bummed for you that your store is closing. But I am impressed that this is such a hopeful message all the same. You never fail to write with your heart. I remember a similar fabric store very well.. squeaky, wooden floors.. and the smells.. Beautifully written.. wonderfully expresses. I know, I've come to expect it from you but you never fail to delight. I love your posts sweet bloggy friend. Hugs and wishes for a day filled with Happy! What great memories of your mother. To have been in a place to see how she came alive and in charge in a situation where she was comfortable. I had to laugh at your mention of an iron. We have one around here somewhere too, it would take a few minutes to find it though. This was a lovely analogy and having been a person who sewed most of my children's clothes when they were young and before I returned to work, I understand your mom. 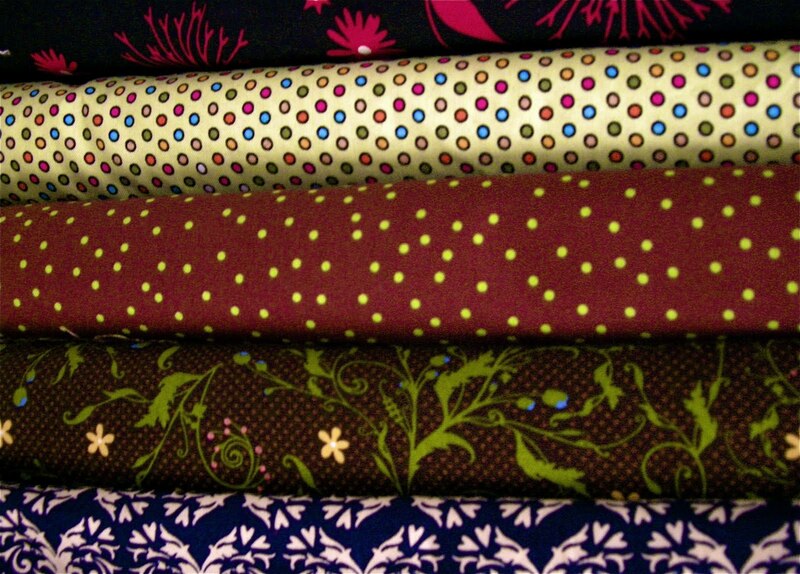 My mom too frequented the fabric store with me in tow and I have similar memories. Although I never actually had the desire to learn to sew. What a beautiful post, I loved the images it conjured - and the memories you shared! I hate to see a business close...and a fabric store is such a wonderful place to go and browse. 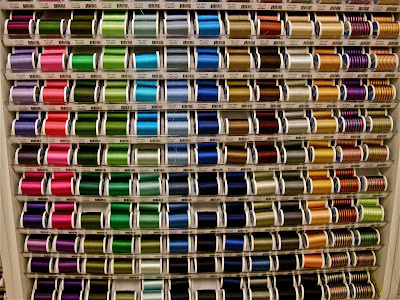 Wonderful post ... colors, like those spools of thread, make my mouth water ... congrats, well deserved, POTW! I love this. I also had a mother who sewed and also remember shopping with her for patterns and material. Fond memories. And I love your comparisons to life. A well deserved POTW. My mother sewed clothes for my sister and I and herself. I taught myself how to sew making doll clothes for my Barbie doll and I made my own clothes as well for many years in high school and college. My aunt made all her own clothes nearly all her life. So fabric stores are a favorite place for me. I love the aisles with bolt after bolt of cloth. I would look at everything until the sizing in all those fabrics made my nose and throat burn. too bad fabric stores are becoming a thing of the past. Not quite the same as going to a big box craft store for your fabric. That was a beautiful post. I used to go to the fabric store with my mom all the time too...maybe one of these days I'll have her teach me how to sew. There was a local grocery store that we went to all the time as well that went out of business last year because of the Wallie World down the street. It made me really sad to see such a big part of my childhood close it's doors. I cried. So sad that is closing down. I love stores such as that one as well. I love that you have all of those lovely memories of time spent with your mother. What a gift. Be Offended. It's Easy to Do. Monday Morning Flowers with Handy Checklist Too!